And so does my planting. I’m about to start a second wave — this one just for flowers — and pulling out the 72 peat pellet tray for the occasion. 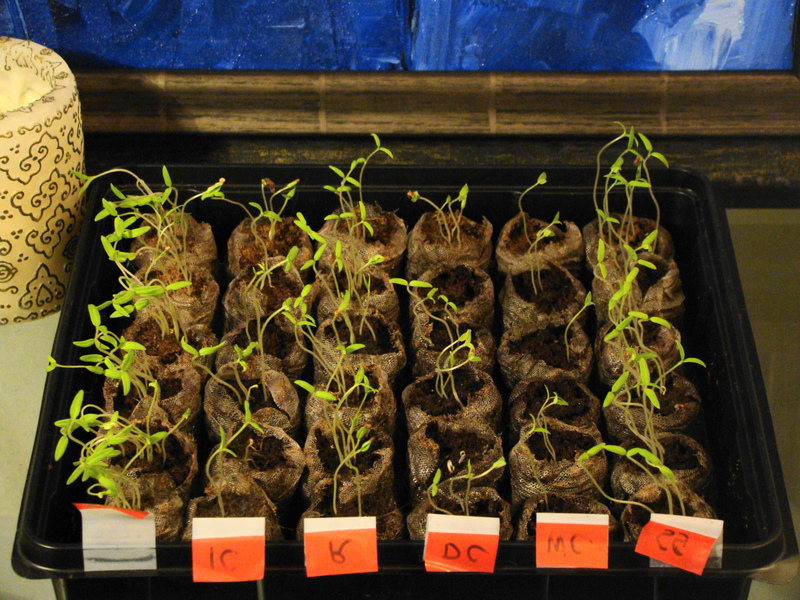 I realize that if you’re a first-timer it’s hard to imagine that these slight seedlings will become strong, fully developed plants, baring flowers and fruit, but it will happen. . . and the process is absolutely fascinating to watch. Do share it with your kids if you have them. I find myself checking every day, sometimes twice a day to see what changes have taken place. I’m also excited about the flower seeds I’m trying for the first time: bells of Ireland, ultra sky blue petunia, wildflower Texas bluebonnet, sunflower honey bear, starflower and cosmos cosmic orange. Since a couple of you mentioned the Himalayan blue poppy, I ordered a pack of seeds for that one, as well, and look forward to adding it to the garden. I have more seed packets than I’m going to be able to use, so I’ve narrowed things down while keeping my color scheme in mind; blue, yellow, orange and green are all represented. I’ll keep the leftover packets for next year. That still leaves me planting about 15 flower varieties. I know it seems like I’m planting a lot of seeds for a small balcony garden. But, I like to pack my planters for thick lush clusters that cascade over the sides. I also spread around a few pots here and there. If everything comes off as planned it’s a pleasure to behold, a bit like a secret garden. Hey Avis, I like how you organise the tray of growing seeds. Very lab like. Hmm… your selected colour scheme… very nice… oh I am so looking forward to see your garden in full bloom later.